The Texas Rangers used to be deep with starting pitching, not necessarily high-end guys, but guys who could take the ball in a big-league game and others who looked to be poised for big futures in the game. Now, they have Cole Hamels, for whom they gave up a lot of those future stars, and they're going to be searching for rotation depth before the 2016 season begins. Yovani Gallardo, the Rangers' starting rotation ERA leader in 2015, and Colby Lewis, their innings pitched and wins leader, are both free agents. 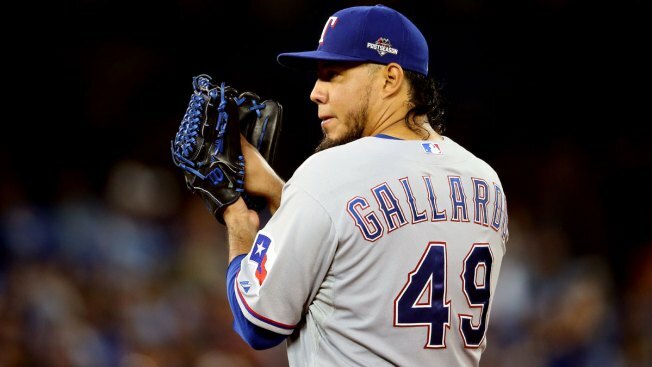 Gallardo is almost a lock to be elsewhere, not because the Rangers wouldn't welcome him back but because he's going to command a pretty nice free agent deal after a career-best year in an odd improvement transitioning from the National League to the American League. That leaves Hamels, who is an ace, Martin Perez, who will be in his second year post-Tommy John, which is usually when pitchers truly return to form, a hit-or-miss Derek Holland and the young Chi Chi Gonzalez, who showed promise in 2015 but lacks an out pitch and is at very best a No. 3 starter, but more like a No. 4 or No. 5, which is OK. Yu Darvish is expected back in May or June from Tommy John surgery of his own, but don't expect him to be at full strength, meaning Hamels is likely the no-doubt ace of the staff. Assuming Gallardo leaves (he will) and Lewis says goodbye to Texas (he most likely will, and that will be hard to stomach), you're looking at an Opening Day rotation of Hamels, Perez, Holland and Rodriguez with something missing. The Rangers could go big in the trade market, once again, and shoot for Oakland ace Sonny Gray, who the A's will be listening on this offseason in true A's fashion, but their minor-league talent pool isn't as full as it was before the Hamels deal. They can't afford to go big in free agency — no Zack Greinke, David Price or Johnny Cueto — but they can go cheap in free agency and go find a No. 3 starter that could slide to No. 4 once Darvish returns. Make no mistake, the Rangers are set up to be pretty dang good in 2016, but they're going to have to tinker with their rotation a bit to get to that point.